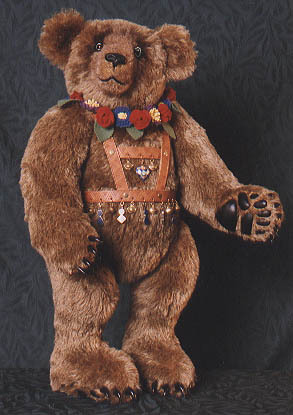 Nakita the Dancing Bear is ready to entertain you with his charming style. He stands 28" tall and is made of 1" extra dense mohair. Every detail is hand made, from his wool felt necklace to his tooled leather drindle. He has trapunto paw pads and sculpted resin claws. Nakita is fully jointed and has flexible arms for hugging too. 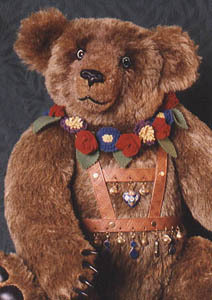 His dangling charms are made of Lapis and look so nice with his dancing bells. This is the last one left in an edition of 5.